There is obvious growing support for Marijuana legalization. There is an even larger support base in general disapproval of the drug war. Federal legalization of marijuana is just one answer and possible solution to the many ills of marijuana's inclusion in the war in drugs. Decriminalization is another often spoken of solution. Currently, only thirteen states have enacted decriminalization laws for the non-medical use of marijuana: California, Alaska, Connecticut, New York, Maine, Massachusetts, North Carolina, Mississippi, Ohio, Minnesota, Nebraska, Colorado and Oregon. In this next graph we can see support of marijuana legalization by demographic and political affiliation. This graph shows an amazing trend. The more liberal you are, the more likely you are to support marijuana legalization. 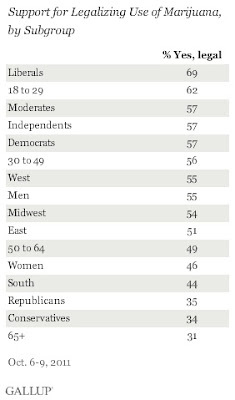 You are also more likely to support legalization if you are younger, are a democrat, moderate or an independent. Generally speaking, if you identify as a Republican or a conservative, the more likely you are to oppose legalization. You are also more likely to oppose if you live in the Souther and Midwestern regions of the country. 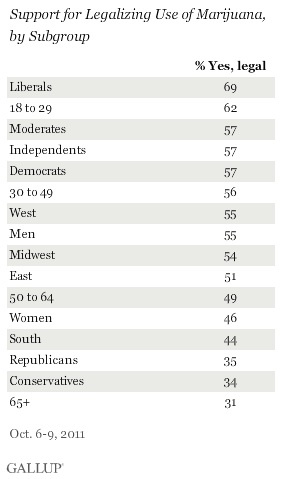 And of course, you are more likely to oppose legalization the older you are. Does this trend sound at all familiar? In my mind it also correlates strongly with levels of religiosity. The older you are, if you live in the South or Midwest, if you identify as a Republican or a conservative, the higher chance you are of being religious. Likewise, the younger you are, the more liberal or democratically inclined you are, if you live in the Western or Eastern U.S., the more likely you are to identify as nonreligious. Broad generalizations yes, but the evidence is clear. My question then is this: Do levels of religiosity directly correlate to ones perspective on marijuana in its legality and morality? If so, why is this correlation present? Why would the religiously minded be opposed to using marijuana for recreational or religious/spiritual purposes? The answer I hope will become clearer in later posts. But these graphs certainly are interesting.